Just because a house is small doesn’t mean that it must have a tiny, cramped kitchen. Although there is no constructive need for a home kitchen to be gigantic, they should be a comfortable size and feel spacious. That’s the focus of small kitchens on this site. A small kitchen in a small house needs to have a clever design, multipurpose components, and an open floor plan – if possible. A clever design relies on innovation to make the best use of space. Multipurpose components like an island that also serves as a dining table enhance efficiency. 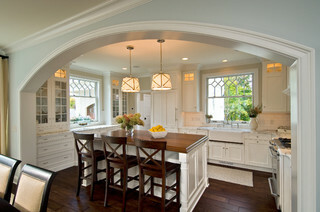 And an open floor plan gives a small kitchen a spacious feel. With a small house, you must design your small kitchen to meet your needs and not those of a 12-person dinner party that you might want to host at some point in the future. Unless you have enough space in your garden to build an outdoor dining area, most small houses are simply not big enough to accommodate a large group. Just hold your big dinners at a community facility, restaurant, or hotel. It’s less work and more fun! 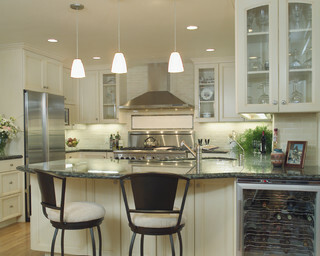 In addition, don’t let your accumulated kitchen equipment dictate how big the kitchen and its storage must be. For example, you won’t need 12 table settings when your small house doesn’t have the seating or space for a group that size. Solution: Downsize! How: Conduct a garage sale, give to family and friends, or donate to charity. Your goal is to reduce your kitchen stuff down to only the essentials. Once you do you’ll love how much easier it is to organize, find, and maintain your kitchen utensils and appliances.